Brief Description: Although the poet often despairs that we cannot always make things right, in many ways this first collection of words of wisdom is a celebration of life. Hunting for wisdom in today's world - in the twenty first century is like looking for a needle in a haystack. This is a collection of work by the author from very young - some from her mother, and some from various courses. About the Author: Jeanette Mann - lives in Buckinghamshire with her family and has spent many years of her career in executive recruitment. She is currently studying business coaching and Reiki, to become a master and trainer. Author's message: "I have written this book with pure love from the depths of my heart, for helping others to have a better life, to be more in charge, stronger, and to share my knowledge and wisdom." 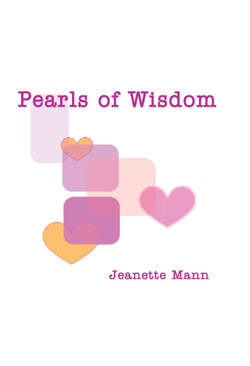 Jeanette Mann is a very special, precious lady with a remarkable aura which you can pick up simply by reading her book, Pearls of Wisdom. I admire her positive, optimistic outlook on and vision of humankind. She will succeed in her quest to bring joy to others and to enhance their happiness in life. Jeanette is truly a remarkable person and her work will inspire others to do just as she is doing - to help heal the world. Although the poet often despairs that we cannot always make things right, in many ways this first collection of words of wisdom is a celebration of life. This is a collection of work by the author from a very young age - some from her mother, and some from various courses. DO you cut out bits from magazines and copy interesting quotations, then pop them in a drawer to get muddled or lost? I do. But Jeanette Mann doesn’t. She’s carefully collected all the quotations that have interested her over the years, added some more thoughts of her own, and put them into books. It was second nature, since her mother had always carefully garnered quotations. Jeanette recalls: “My mother had a blackboard on the kitchen wall. My friends used to run back home with me each day to see what she’d put up as Thought of the Day. Jeanette was brought up in Old Windsor with a mother of South American background, and a father of Japanese, Chinese and Malaysian background. Jeanette, 55, now lives in Great Missenden. She used to run a recruitment company and now works as a counsellor and teaches reiki. Her first book, Pearls of Wisdom, was published last month, followed closely by the second, out this week, Words of Wisdom, Friendship and Inspiration. The books reflect a wide range of inspirational quotations from poets, statesmen and visionaries, as well as her own thoughts on life and loving. •	Pearls of Wisdom, and Words of Wisdom, Friendship and Inspiration, are both published by Apex at £14.99 each. I would recommend 'Pearls of Wisdom' to anyone, its inspirational, spiritual and very moving, it seems to touch your soul. Both my wife and I were so touched by the powerful words in the book, we were both crying. The book will certainly help me in my career and my kids to be better parents and husbands. I really love the part 'special keys...to your children's happiness', its wonderful, I feel every parent should read this. I would like to buy all of Jeanette's books." A wonderful collection of readings. It is all too easy to fall into the trap of 'negative thinking', especially when times are difficult and life seems to consist of endless demands, alloing virtually no free time to pursue your own interest. It is touching, and a truly inspirational read with words that warm the heart, and which I without a doubt will read over and over again. 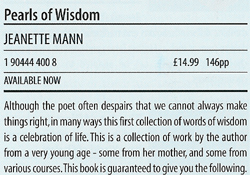 I will certainly be recommending it to others, and look forward to reading other publications by Jeanette Mann.